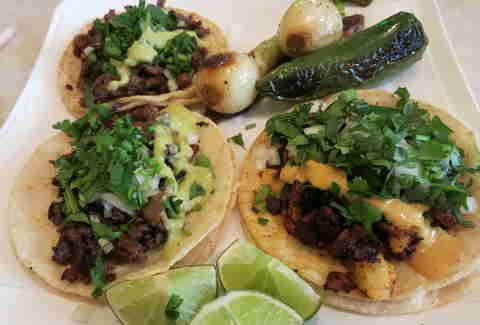 Tacos are an integral part of one's diet, to be consumed whether its the AM, the PM, or some nebulous time in the middle where you’ve had a few pops and aren’t sure/don’t care what time it is. For those times, these taquerias that cater to the late-night crowd will give you some much-needed sustenance on the trek home. To be added to your “stumble upon” list, here are nine late-night taco shops that all share a closing time -- if any -- of well past midnight. Despite being open 24 hours this Clark Street strip-mall taqueria serves tacos that are still expertly prepared at all hours of the day. You don’t have to have been drinking to enjoy the meal, from the silky smooth suadero (beef brisket) to the extra-tender lengua (tongue) you will eat well and get friendly service for it being ungodly late/early. 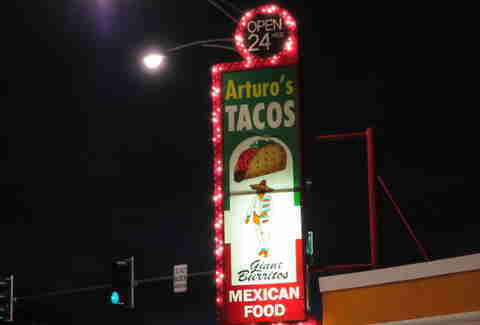 Even in a steadily yuppie-ing neighborhood, late nights at Arturo’s still draw a nice eclectic crowd. When nine out 10 places serve al pastor meat that never came from a cone it's great to find a spot that’s still carving its meat at all hours. 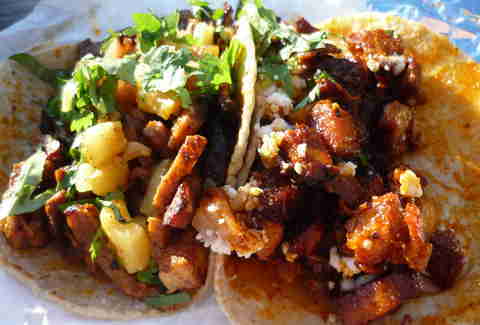 The tacos al pastor and other house favorites are very solid after-midnight eats. This Texas import serves non-traditional tacos that are much better than they have to be, especially for the Viagra Triangle last-call crowd. Try interesting takes on global dishes that come served on fresh tortillas made in-house and enjoy a spiked frozen margarita while doing so. The best late-night tacos on Ashland Avenue are just North of Chicago Avenue at this long and narrow taqueria. 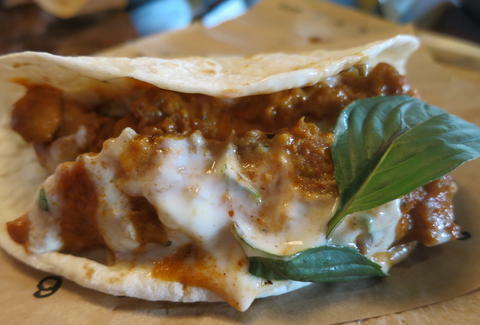 It already has a cult following that's known what's up forever but the swift service will expedite the taco-eating. 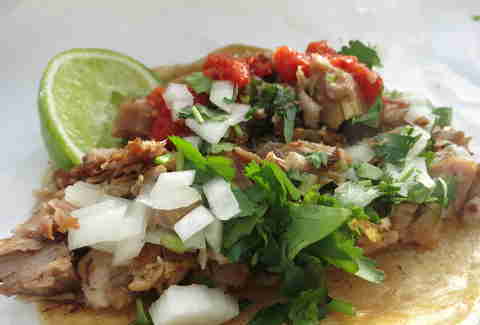 This local favorite on 31st Street has been serving fresh carnitas al estilo Michoacán and barbacoa since 1989. You can order either by the pound or in taco form. For the adventurous that have an Andrew Zimmern-like hunger there's the Mexico City-favorite tacos de buche aka pork stomach. At some point, every Chicagoan has wandered to Big Star’s to-go window after a much-too-late night in Wicker Park, like the North Star guiding you past bad decisions. Here, you can eat quality pork belly tacos, make use of the spacious patio, and possibly gain a second wind before going back into Estelle’s to rescue your friends. 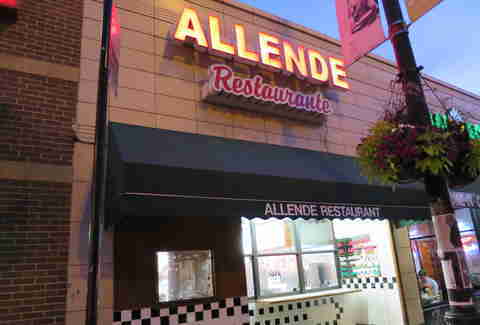 Allende has been serving up the epitome of cheap and greasy late-night tacos longer than most of its neighbors have been around. Perfect for a post-Lincoln Hall concert food stop and also for the college students that live nearby. 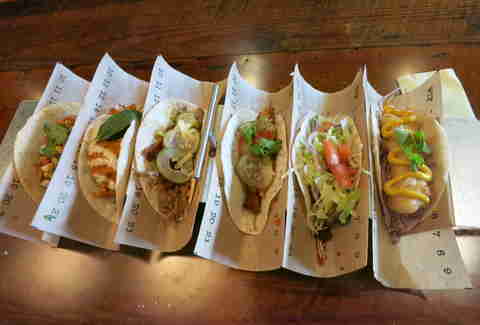 With a handful of locations scattered throughout the city you're never too far from solid Mexican from El Gallo Bravo. We tend to lean towards the North Side strip-mall location due to the grillman's excellent ability to get the steak meat crispy and the burritos ain't too shabby either. 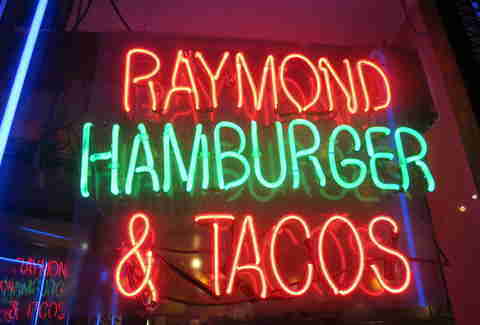 Raymond’s draws a loyal following for its cheesy tacos which are made by melting a slice of salty American cheese in between two tortillas before piling on the fillings. As you can imagine, these are best consumed after midnight.